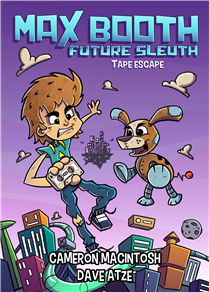 Tape Escape is Book 1 of the Max Booth Future Sleuth series and introduces 11-year-old Max and Oscar, his robotic dog, in the year 2424. After escaping from the Home for Unclaimed Urchins, Max is constantly on the run from the Unclaimed Urchin Capture Squad. He and Oscar now live in a cosy box in a museum storeroom after being befriended by Jessie, the storeroom supervisor. Jessie often enlists Max to help her solve the mysteries surrounding some of the artefacts she must identify from the 20th century. In Tape Escape, Max is mystified when presented with a cassette tape from the 1980s. After sneaking into the library and conducting dangerous research, Max devises an ingenious technique of playing the tape and discovers that it contains recorded music from the legendary David Snowie. The tape is worth millions. When it’s stolen by an evil forensic musicologist, Max and Oscar must recover the tape and return it to Jessie and the museum. Max’s world feels real from the very first page. Readers 8-10 will enjoy the blistering pace, the humour and also the clever, futuristic contraptions that are integrated into the action. The black and white drawings scattered throughout add visual cues that enhance the story and characters. I highly recommend this book to young readers, as they will be taken on an enjoyable journey into the recent past as well as into the future. They don’t need to have lived in the 80s to enjoy the humour in this book, but it will touch some funny bones in parents and teachers as well. I will definitely look forward to Book 2: Selfie Search. Cameron MacIntosh has written more than 80 books for children and edited hundreds more for educational publishers. He has studied Psychology, Italian and Professional Writing. When he’s not wrapped up in the world of books, he sings and plays guitar in his Melbourne home. Ann Harth is an author, ghostwriter, writing mentor and manuscript assessor. She loves to read and is committed to creating and helping to create children's literature that inspires, entertains and triggers a tiny twist in the mind.